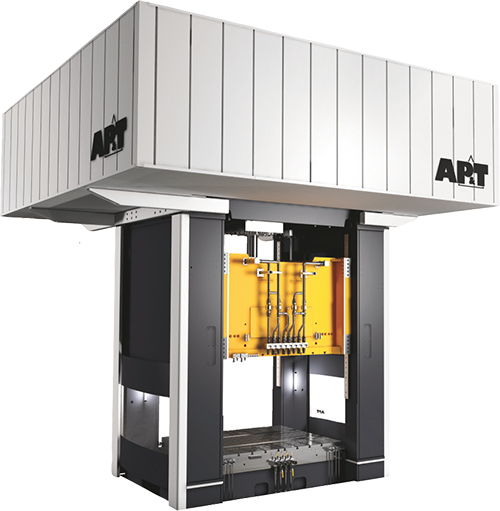 AP&T North America Inc. has introduced a new servo-hydraulic press, which reportedly offers short cycle times, high precision, low energy consumption and minimum need for maintenance. The press features several technical innovations. First and foremost, the hydraulic system’s control valves have been replaced by servo motors, which means that speed, position and press force are completely controlled electrically. The servo-motor solution also reportedly has reduced energy consumption by 40 to 70 percent, depending on the application. Heat loss generated by pressure valves can be avoided, and some servo motors are used as generators during nonworking portions of the stroke. The press’ cushion cylinder also is operated by servo motors that work as generators. Braking energy distributes to motors used for acceleration and forming through a kinetic storage system and a central direct-current converter. Because energy stores within the press, electricity from the grid during peak loads is not required, resulting in a lower connection fee. Stored energy surpluses also can be restored to the grid. A closed-loop system monitors the entire press process and continuously controls slide movements, quickly corrects any deviations, and ensures precise speed and position, according to company officials. Also, the system actively governs the slide’s parallelism in relation to the press table—a unique integrated function that contributes to high forming precision and less tooling wear. “The acceleration and retardation speed is an impressive two to three times higher than that of a conventional hydraulic press, thus enabling extremely short cycle times,” Haglund says.